We haven’t seen Mr and Mrs Previous Owner for quite some time, what with moving, retirement blues, Christmas, New Year, the flu, Granada, getting over the flu and finishing the glass doors and shutters. However, we are now sufficiently en forme for a visit. Mrs Previous Owner emails me and suggests either dessert and coffee or an apéritif. We decide on dessert and coffee because we know that the apéritif means a lot of vouvray and we’ll be driving to their home a half an hour away. We’ve also scheduled a visit to the nearly Brico Depot DIY to buy a window for the laundry. I always feel badly when we see their house. Having to trade Closerie Falaiseau, which they spent twenty years lovingly doing up, for a modern house, must have been very hard. Fortunately, our enthusiasm for the Closerie helped them to get over the hurdle of having to sell for financial and health reasons after they both retired. When we get there at 1.30 pm, Mr Previous Owner, who is very punctual, welcomes us in and I am a little surprised to see that neither the living room table nor the kitchen table are set. Mrs Previous Owner appears and I give her the enormous bouquet of daffodils that Jean Michel gathered in our little wood earlier on. 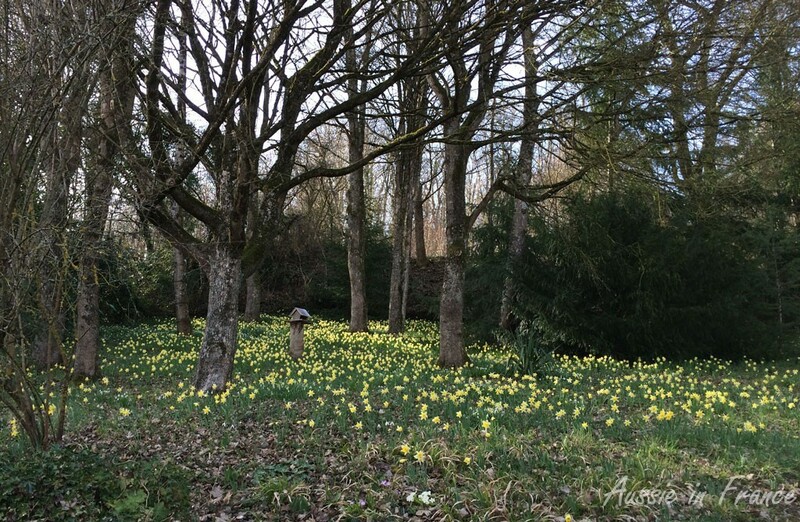 We have Mr and Mrs Previous Owner to thank for our wonderful carpet of daffodils. Mrs Previous Owner takes us through to the veranda that fronts onto the kitchen. Despite the fact that we’ve been to their new home several times, I have no recollection of a glassed-in veranda! 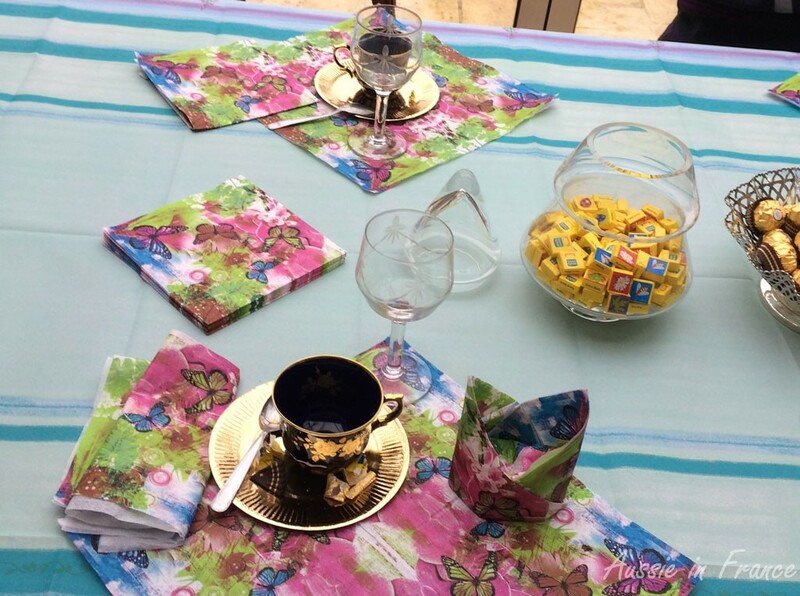 The table is set with plates, serviettes, wine glasses and coffee cups. 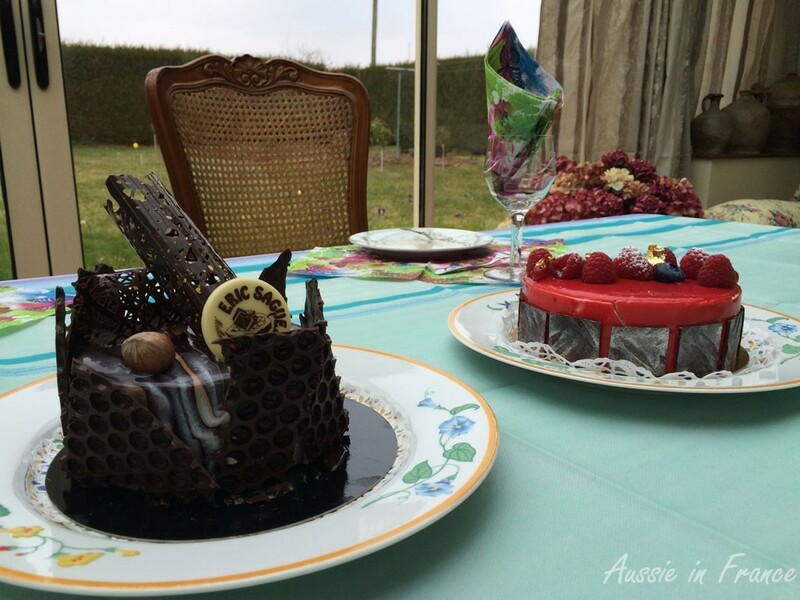 We sit down and Mrs Previous Owner brings out not one, but two stunning cakes from a local pâtisserie. I don’t know what the situation in Australia is today, but back in my youth, no one would have dreamed of inviting someone over and not baking their own cakes or biscuits. In France, however, that is not the case and cakes bought at a good pâtisserie are more than welcome. Thanks to my iPhone, I am able to show them the new glassed-in doors and shutters. They are suitably impressed. 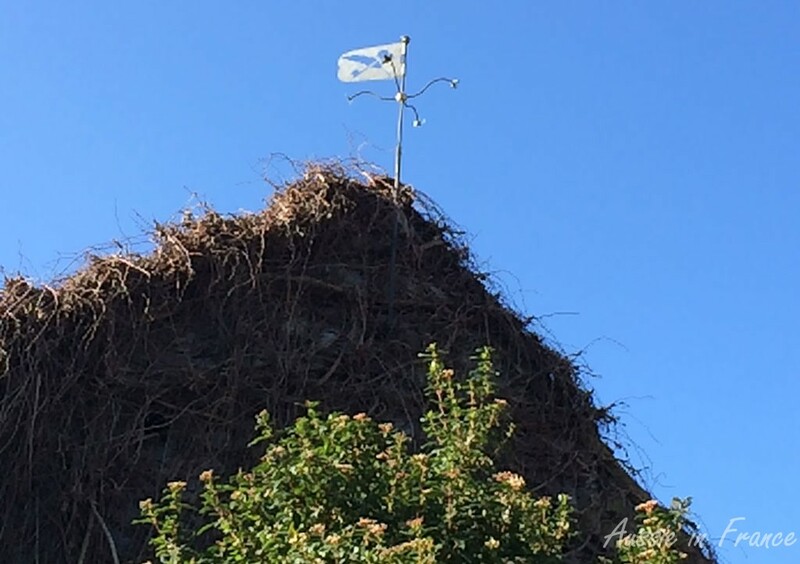 I tell them about the broken weathervane and Mr Previous Owner immediately says that if it happens again, he’ll be more than happy to repair it. A little later, after coffee, when Jean Michel and Mr Previous Owner are in deep discussion about our alarmingly high property tax, I learn that Mrs Previous Owner hasn’t downloaded the photos on her iPhone for 3 years. We go upstairs to the computer so that I can show her how to do it. It’s getting late and we still have to buy the window so we take our leave and promise to see them again soon at the Closerie, when the wisteria is in bloom. 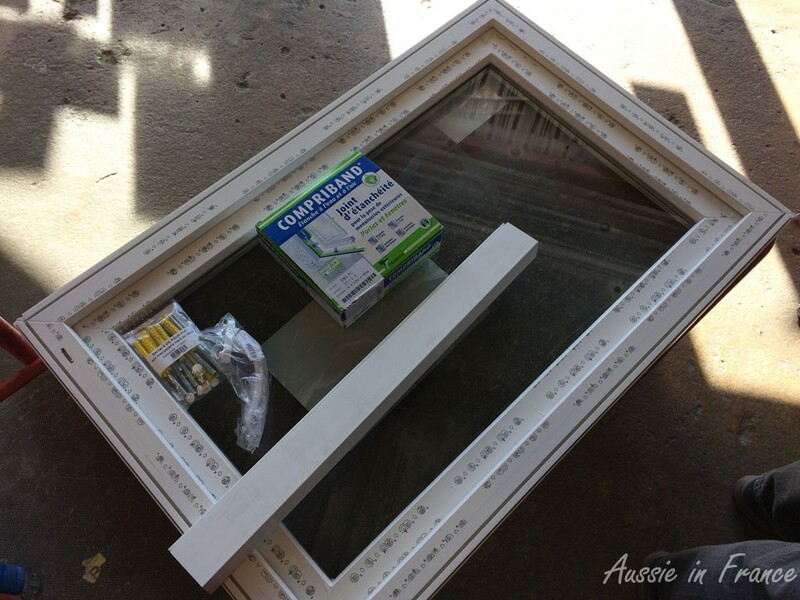 At Brico Depot, we learn that they only sell white PVC turn and tilt windows which are not what we want since all our other windows are stained a dark oak colour. At least we haven’t gone out of our way. Two days later, however, having checked the prices for coloured PVC and wooden windows which turn out to be five times higher, we go back and get a white one. It is, after all, at the back of the house, down near the woodpile in an area which I intend to close off with bushes so I can put up a discreet clothes line. But that’s another project! 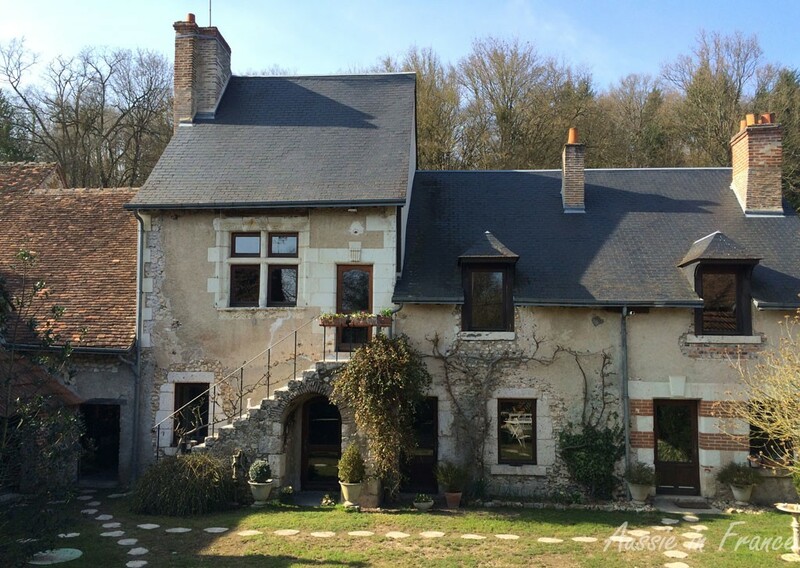 This entry was posted in Blois, Closerie Falaiseau, Flowers & gardens, Food, French customs, Renovation and tagged Eric Saguez cakes in Blois, renovating an old house in France. Bookmark the permalink. How nice that you keep up a relationship with the former owners of Closerie Falaiseau. It must have been very hard for them to part from this charming, old house. Yes, we are very pleased to keep our relationship. They are lovely people and thanks to them, we have a lovely garden and many wonderful features. Mr Previous Owner also made the little lead light windows. I see the daffodils are in their full glory. Those cakes look absolutely divine! What willpower I’d need to walk past that patisserie without buying everything on display. It sounds like the former owners of your house are lovely. They really were delicious, especially the chocolate one. However, I suspect that the prices might prevent you from buying too many … Yes, our former owners are lovely. They left us many beautiful things in the house, such as traditional bread raising baskets, a wooden scythe sheath, utensils for the bread oven, etc. because they right said that they wouldn’t look right in their modern house. Such a heart warming read. Alas very few Aussies bake cakes. The street or fete cake stall are rare and often people donating have bought from a bakery. Rather than inviting people for coffee and cake it is now for a glass of wine and cheese. Desserts are the ‘in’ thing when having a dinner party..
Coffee has over taken the cup of tea and sidewalk coffee bars are rapidly multiplying on every street corner. There is always a selection of pastries, muffins and cake portions but they never taste as delicious as they look. There were more crocus’s on BBC weather page. How disappointing! Not that I have much of a sweet tooth but I’ve come to appreciate the finer things that French pâtisseries have to offer! I agree that cakes often disappoint. Cheese is rarely served as an apéritif here probably because most people like to eat it with red wine which is also unusual as an apéritif. Thank you for the crocuses. I had some turn up in a forgotten pot today! I was watering my pot plants last night and discovered 2 tiny pots of a hyacinth and daffodil sprouting. I was given them in flower last year and couldn’t throw them away. I was hoping the unbelievable might happen, and it has. I should have added that we are expecting 35 C today, so what are their chances of continuing to grow? That really is astounding! I do hope they continue. Unlike daffodils, hyacinths degenerate from one year to the next, even if you pull them out and store them for the winter. We decided to replace all our bulbs to see what would happen this year and all the hyacinths are about half the size they were last year. I have an orchid in my downstairs living room that, to my great amazement, is about to flower. I would have thought it was too cold.